A nest box programme for the endangered Blue-throated Macaw has been launched in the Barba Azul Nature Reserve by Asociación Armonía, World Land Trust’s (WLT) conservation partner in Bolivia. WLT is assisting the programme by supporting the employment of wildlife ranger Rene Cartagena with funding from WLT’s Keepers of the Wild appeal. 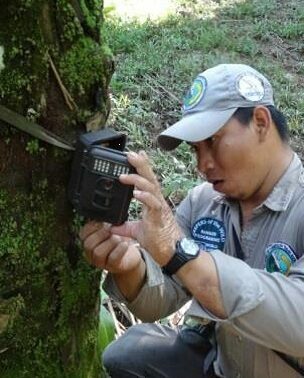 So far Rene has helped install 20 nest boxes in Barba Azul Nature Reserve, which is owned and managed by Armonía. Rene will also be responsible for monitoring the boxes. Although Blue-throated Macaws spend half the year foraging and roosting on the Barba Azul reserve, at the moment they do not breed on the reserve. But, Armonía believes it will be possible to entice them to take up nest sites in the new boxes. Endemic to Bolivia and registered by IUCN as Critically Endangered, the Blue-throated Macaw is a conservation priority for Armonía and WLT. Blue-throated Macaws arrive at the reserve in high numbers in May and forage on Barba Azul until late November. From there, the pairs disperse widely throughout the private ranch lands in the Beni savannas searching for a forest island with a safe, large tree cavity to breed. Barba Azul reserve was created in 2008, but Armonía has only had access to the Tiniji River forest islands since 2014 following the expansion of the reserve in late 2013. The land purchase to expand the reserve was made possible with financial support from WLT’s Buy an Acre fund and other international donors. The Blue-throated and Blue-and-yellow Macaws know the Tiniji River islands are safe because they roost there after foraging throughout the reserve. But, if they know the islands are safe, why aren’t they breeding there? The Blue-throated Macaw requires a large nesting cavity in which to breed. Such cavities were abundant in the past when trees were left to grow very old and then left to rot. But as a result of 150 years of ranching in the area the old growth deciduous trees have been removed along with most of the larger trees. The macaws will take time to adjust to these new boxes. They are intelligent birds and much of their behaviour is learnt from their parents and their environment. Chicks that hatch from a certain type of nest cavity will tend to look for that same type of cavity when they come to breed. But birds also learn from the actions of other birds. The breeding season starts around December. It might take a year or more for the birds to come to terms with the boxes as viable nest sites but we are looking forward to good news in the future. Armonía has already used nest boxes to successfully create viable nesting sites for an isolated population of Blue-throated Macaws south of the city of Trinidad. 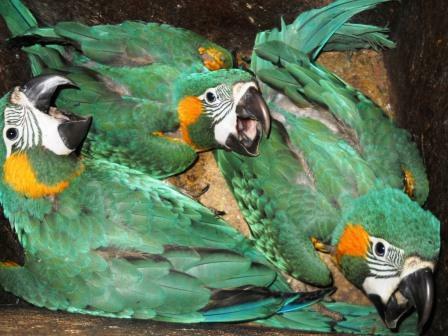 For five years there has been an average of eight Blue-throated Macaw chicks fledging from these boxes in the province of Marban, witnessing a dramatic quadrupling of the local population. Learning from the Marban nest box programme, staff of Armonía have adapted the design of the nest boxes to be more suitable for the Blue-throated Macaw than for the Blue-and-yellow Macaw, which competes aggressively with the Blue-throated Macaw for nest sites. The boxes have also been lengthened because the size of the nest box seems to be a factor in how many large chicks a pair of macaws can have. In the Marban area each year at least one pair of Blue-throated Macaws has successfully fledged three chicks. The wooden planks for the Barba Azul nest boxes were cut in Loreto by carpenters familiar with the nest box design and suitable timber. The cut planks were transported to Barba Azul by truck, across the river by boat, half way to Rio Tiniji by tractor, and then to the final destination on horseback. In late August 2014, Keeper of the Wild Rene and Hernan Lopez transported materials for 20 new nest boxes to palm forest islands along Rio Tiniji. The boxes were assembled on site and installed on motacu palm trunks strong enough to hold their weight. The next challenge for Bennett and Rene is to find a way to review the boxes during the breeding season. Access will be difficult because most the area will be flooded and there may be deep water and mud. In the meantime Armonía has purchased a canoe which may prove to be the best means of transport to the islands when the river is high during the rainy season. Other options under review are a floating 6×6 vehicle, horseback, or even a drone. You can support Armonía’s conservation to save the critically endangered Blue-throated Macaw by making a donation to WLT’s Keeper’s of the Wild appeal. The nest box project is supported by American Bird Conservancy, Bird Endowment, BirdLife International’s Preventing Extinction Programme, The Mohamed bin Zayed Species Conservation Fund and Loro Parque Fundación. 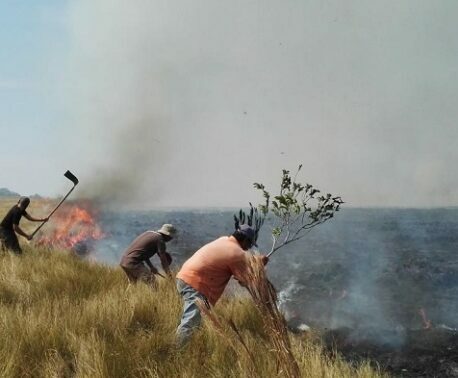 The project is part of Barba Azul Nature Reserve management which is also supported by International Conservation Fund of Canada, Neotropical Migratory Bird Conservation Act of the US Fish and Wildlife Service, and WLT’s Keepers of the Wild Ranger Programme.